The Kids' Lit Quiz is an annual literature quiz for students aged 10 - 13 years. Quizzes are held in Australia, Canada, Hong Kong, Indonesia, New Zealand, Nigeria, Singapore, South Africa, Thailand, United Kingdom and USA. The winning team from each heat competes in a National Final. National champions compete in the World Final. 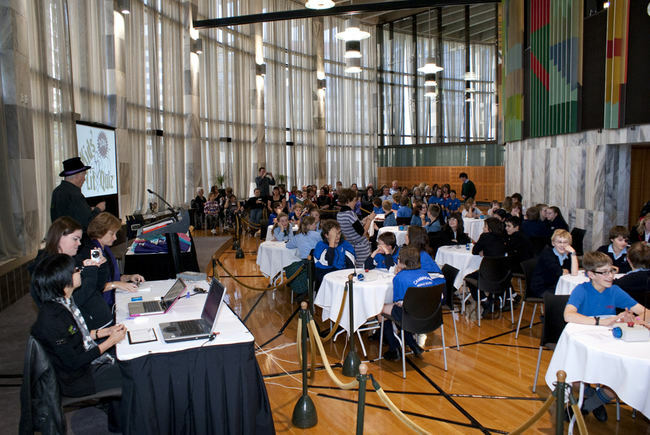 The quiz was founded by New Zealand quizmaster Wayne Mills, who reads enough books to write several thousand questions each year. You can test your team on some of Wayne's questions by visiting our Question Bank. Teams of four students are asked to answer 100 questions on children’s literature divided into ten categories, which vary each year. Each team is provided with a set of blank answer sheets and are asked to write the name of their school at the top of each of the ten sheets. One student acts as the scribe, and after consultation with the rest of the team writes the answer to the questions on the printed sheets provided for each round. At the end of each round, the sheets are gathered up and checked against the “answer sheets” by a team of markers. Each correct answer receives one point. An incorrect answer does not receive any points. A half point could be awarded at the discretion of the moderator. Examples of categories set previously include poetry, authors, titles, settings, characters, and nursery rhymes. Between each round, whilst the marking is taking place, the Quizmaster asks questions of the spectators, giving them the chance to win books and coins. The National Final consists of five categories with 12-15 questions in each category. All teams start with ten points. The questions are read out by the Quizmaster and once a team suspects they know the answer they push a buzzer. An incorrect answer loses a point but a correct answer gains two points. The questions may begin obscurely but do move to the obvious. A team may push the buzzer at any time. Once a team has buzzed with an incorrect answer, they are not allowed to buzz again in that round. The World Final consists of ten categories with seven questions in each category. The questions are read aloud by the Quizmaster and once a team knows the answer they push a buzzer. An incorrect answer loses one point but a correct answer gains two points. The question may begin obscurely but gradually moves to the obvious as more of the question is read out. Our demo video will give you some of the flavour of a Kids' Lit Quiz heat. Our Enter a Team page gives you all the information you need on how to participate. To see how Kids' Lit Quiz has been reported in the press, please see our Press Coverage page. We are very grateful to our sponsors and supporters. Please see the national competitions pages to see who sponsors KLQ in your country. We are always keen to invite more sponsors to come on board. If you are interested, please contact us. Who pretended that her mother was a famous Hollywood movie star in a series by Jacqueline Wilson? Do you know the answer? Find out here!